You all knew this was coming, right? Or at least you had a strong feeling it was coming after you saw (and maybe even read) the posts I published over the last few weeks about some of the 3DS, DS, PSP, Vita, Wii and even Xbox 360 games I'm looking forward to playing in 2016. At any rate, here's a little write-up about six of the older games I want to buy and play between now and the end of this year. 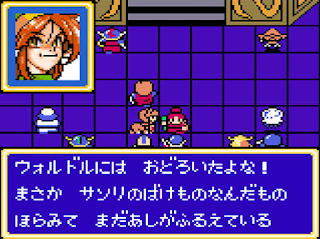 Bahamut Lagoon (Super Famicom)--I'm not sure how it came to be that I've played at least a smidgen of all of Squaresoft's Super Famicom titles except this one. Oh, and Hanjuku Hero. Anyway, I've been curious about this strategy RPG since it was first released back in 1996, so I figure now's as good a time as any to finally give it a go--especially since I'm currently on a bit of a SuFami kick at the moment. Dig Dug II (Famicom)--OK, so I've actually spent a few minutes with this odd sequel to Namco's arcade classic before now. The emphasis should be on "few," by the way. Why haven't I spent more time with it? To be honest, its gameplay, which veers quite a distance from that of the original Dig Dug's, didn't sit well with me. Still, I want to own an actual copy of Dig Dug II (I've only experienced it via emulation up to this point), and I'm desperately hoping the expenditure will prompt me to push past my indifference and find a way to appreciate, if not embrace, this 1986 release. Kaze no Notam (PlayStation)--Considering copies of this Japan-only PlayStation title, made by those wonderful weirdos at Artdink, cost just a couple of dollars these days, it's ridiculous that I've yet to pick one up. It's even more ridiculous given that it's been on my "to buy" list for ages now. Of course, how could it not be on such a list? 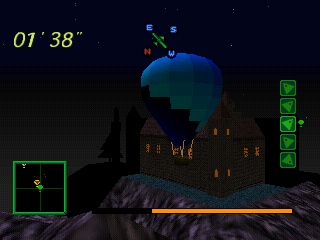 It's a game that tasks players will piloting a hot-air balloon, for crying out loud. Granted, this surprisingly recent review of Kaze no Notam makes it sound like more of an "experience" than a proper game, but that doesn't bother me much. Rhyme Rider Kerorican (WonderSwan)--Here's another old game I've had designs on owning for years. That's easy to understand when you read its credits--namely, that it was developed by the folks at NanaOn-Sha, better known as the makers of PaRappa the Rapper, UmJammer Lammy and Vib-Ribbon. 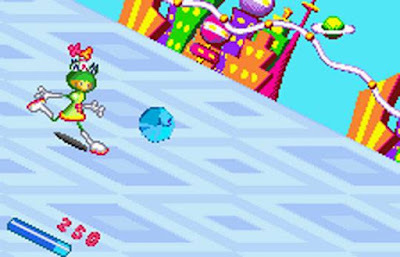 Rhyme Rider Kerorican isn't supposed to be anywhere near as good as those classic PlayStation games, but I want to own--and play--it anyway thanks to its cheery visuals and its "generative melody" (which means its soundtrack changes based on your in-game actions). Salamander (PC Engine)--I'm a big fan of Konami's output during the 8-bit and 16-bit eras. As such, I've played a lot of their games from those years--especially the ones that are part of the shmup (or shoot 'em up) genre. The odd man (if you can imbue a video game with gender) out here is this Gradius follow-up. Why have I given it the cold shoulder for so long? This is shock a good number of Salamander fans, I'm sure, but the simple truth is that I've never really cared for this game's aesthetics. Also, I've never been all that keen on top-down shmups. (The unquestionably fantastic Pop'n TwinBee for the Super Famicom is a rare exception.) Despite those misgivings, one of my many gaming-related goals for 2016 is to give Salamander a second chance--and hopefully walk away from the encounter with a newfound appreciation for this seemingly unique title. Shining Force Gaiden (Game Gear)--The first pair of Shining Force titles, which were released for the Genesis (or Mega Drive) back in the early 1990s, are two of my all-time favorite games. Sadly, that love has yet to translate into me picking up copies of this vaunted series' Game Gear spin-offs. Which is a shame, as all three of them look like quality efforts. On top of that, none of these releases seem to be horribly expensive these days, which is a definite plus in this era of skyrocketing retro-game prices. Are you hoping to buy and play any particular retro games within the confines of this year? If so, let me and others know which ones in the comments section that follows.